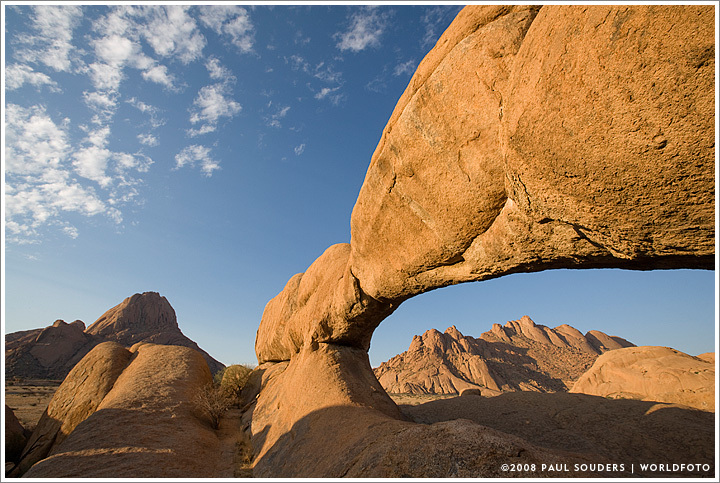 The Setting sun lights granite arch and rock formations surrounding Spitzkoppe mountain in Namib Desert. Photographed January 31, 2008 with a Canon EOS-1Ds II camera and 16-35mm f/2.8ens. Exposure 1/40 second at f/11. This entry was posted on Thursday, January 31st, 2008 at 7:43 am. It is filed under On the Road and tagged with Africa, Desert, Landscapes, Namibia. You can follow any responses to this entry through the RSS 2.0 feed.